Normally, when two Quinnipiac students stop at Starbucks for a latte before class, they grab their drink and go. 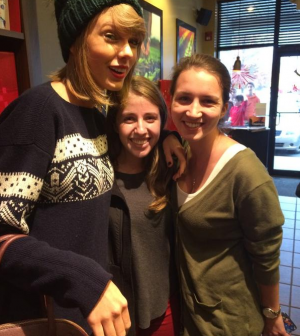 But last Thursday proved to be no normal afternoon for juniors Kathleen Barry and Nicole Giuliani, who met pop star Taylor Swift when she stopped by the Starbucks in North Haven around 3:15 p.m.
“I was throwing out my coffee as someone walked in,” Giuliani said. “To be honest, it was her height that gave her away.” Giuliani said she and Barry were excited to see Swift. Giuliani said Swift used the bathroom before interacting with any customers. Both students took a picture with Swift, which was then posted onto the various Quinnipiac University social media accounts. Other customers and baristas spoke to Swift as well. Swift was in town to visit the family of North Haven resident, Stephanie Barnett, according to NBC Connecticut. Barnett had previously connected with Swift when she was having a difficult time becoming pregnant. Now, Barnett’s son Leyton is 2, so Swift decided to drop by and surprise the family with some fun gifts for the boy.